Rental facility information for Watson Lodge at Kamp Kiwanis Calgary. Watson Lodge is a rustic, yet modern building. It includes three bathrooms. A rental facility with meeting, dining for 65 people, and sleeping facilities for 36 people, with additional cabin bunkroom space for 24 people in historic log cabins. This building has received many upgrades over the past couple of years, including high quality commercial linoleum in the dining hall, washroom and extensive renovations to the kitchen facility. It was constructed in 1960 in a one day 'barn raising' event by the Kiwanis clubs of Calgary. It served as our Main Lodge for over 35 years. This building is available for rentals throughout the year except between the fourth week of June and the third week of August (during this time it is used for the Kamp Kiwanis summer program). This building is named in honour of Bill 'Curly' Watson, a Kiwanis club member who was instrumental in the creation of Kamp Kiwanis Calgary. Watson Lodge includes four bunkrooms. 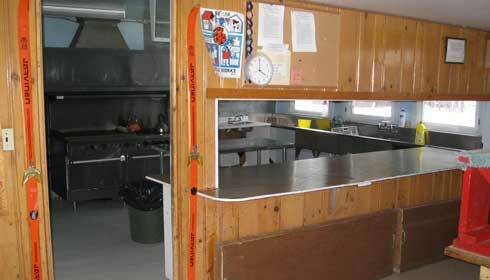 The dining facility in Watson Lodge seats up to 65 people. Seating is camp style on benches, 5 people to a bench. The dining hall has an easy to clean, high quality commercial linoleum installed in January, 2008. Food Services can be provided by Monet Catering, Matthew Prosser, chef@kampkiwanis.ca. However, many groups using Watson Lodge decide to do their own cooking. If Kamp Kiwanis provides meals, the menu is negotiated between our Chef and the coordinators from every rental group. 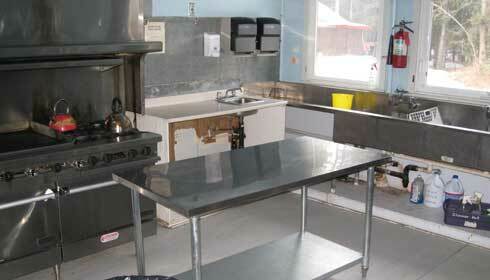 The kitchen facility in Watson Lodge includes three stainless steel sinks, new windows, refrigerator, freezer and some cleaning supplies. A variety of pots, utensils are available including place settings for 50 people. Watson Lodge has two meeting spaces; the Dining Hall and Parkinson Lodge. Parkinson is a 1940's era log cabin with its own fireplace. These spaces are most appropriate for groups looking for a 'camp' experience. Watson Lodge sleeps a total of 36 people and includes four bunkrooms, an indoor washroom with 2 sinks and 3 flush toilets, and 2 showers.. Little Deeves is a bunkroom that sleeps 12 people on metal frame bunk beds with vinyl mattresses. Carlyle bunkroom sleeps 12 people, and Jack & Joe's sleeps 4 people. Baines Nook is the fourth bunkroom and sleeps 4 people. For groups requiring additional space, Baker Cabin is a log cabin that sleeps 12 people; Woodside Cabin sleeps 12 people. The log cabins are heated by natural gas fireplaces and are most appropriate for use between April and October of each year.